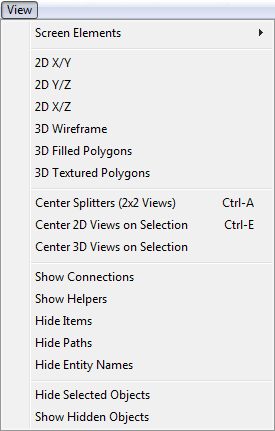 The View menu contains items to control the display of screen elements of the currently active map window. Toggles the visibility of a specific screen element (see right screen). Currently this works only for Console. This menu item will be revised and documented later. If the splitters that separate the 3D view and 2D views have been shifted, this item moves them back to their initial position. Centers all 2D views onto the selected object. Centers the 3D view onto the selected object. Toggles point based entities visibility. Toggles entity names visibility in 2D views. Hides the currently selected objects. Shows all currently hidden objects.